Our extensive inventory of wood veneer sheets makes us the world’s leading supplier. If you have struggled to find a source in the New York City area for the quality wood veneer sheets you need for your hobby or business, you’ll be happy to learn about what we have to offer at Sauers & Company Veneers. Our family-owned and operated veneer company has been in business for more than 50 years, serving the needs of woodworking enthusiasts and some of the largest domestic manufacturers of furniture. Our wood veneer sheets are produced in the U.S. from the finest veneer leaves having an average thickness of 0.24. Our attention to detail provides for virtually imperceptible splice seam lines, so you can obtain the best results for your project. We offer a wide variety of backings, including 10Mil paper, 10Mil paper, 30Mil paper, 3M PSA (peel and stick), 2-ply (wood on wood), phenolic, and ply backings. You can choose from more than 125 species with wood veneer sheets in light, medium, dark or even dyed shades. With our extensive inventory that normally ships within 24 to 48 hours after order placement, you are assured of the products your project needs. Custom orders can also be arranged and shipped within five days after receipt of order. Be sure to let us know if you require overnight, second day air, or Saturday delivery, with an additional charge. 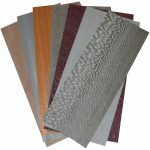 Our wood veneer sheets come in 1’ x 8’, 2’ x 8’, 4’ x 8,’ 4′ x 10′, 4′ x 12′, 5′ x 10′, and 5′ x 12′ sizes. Should you need assistance determining the size you require, or need other questions answered about our veneer products, don’t hesitate to contact our knowledgeable team. We look forward to serving your wood veneer needs! At Sauers & Company Veneers, we create wood veneer sheets for residents of Anaheim, Los Angeles, and San Francisco, California; Dallas, Texas; New York City; Chicago, Illinois; Boston, Massachusetts; Charlotte, North Carolina; and anywhere else in the United States.